‘Challengers’ is our Charity of the Year! We are proud to announce that ‘Challengers’, a Guildford-based charity, has been selected as our Charity of the Year! To kick off our support, we have donated £500 to the charity. ‘Challengers’ provides inclusive leisure opportunities for disabled children and young people in schemes throughout Surrey, Hampshire and beyond. Our partnership intends to build a link between The Friary Guildford and the community by enabling employees to be actively involved in fundraising for Challengers. Fundraising plans for the year include Orange Friday, where participants are encouraged to dress in an item of orange clothing and donate £1, and, Play Day in August where participants donate to play games over lunch. These and much more will help to raise money for play equipment and educational resources. Rachael Millward, Marketing Coordinator here at The Friary Guildford, said: “We’re really impressed by the work Challengers do. Their commitment to providing challenging and, most importantly, inclusive play and leisure activities for disabled children and young people across the county is truly inspiring. 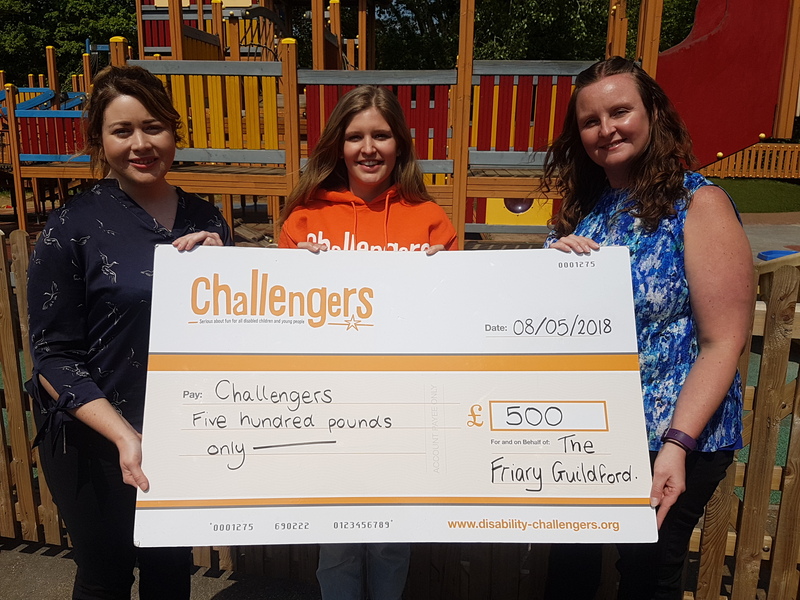 Susie Jewell, Corporate Partnerships Manager at Challengers added: “This donation will make a huge difference and will help disabled children and young people to access a truly inclusive environment that allows them to challenge their impairment, make friends and most importantly have fun. Just some of the activities we have planned at our schemes this year include mobile farm days, drumming workshops and messy art days. We are extremely excited to work with Challengers and to be able to help raise money for such a fantastic cause.